Vijay47: Thank you, Inspector-General of Police Mohamad Fuzi Harun, for your most enlightening explanation on why lawyer Ambiga Sreenevasan is under the police microscope. Pardon me if I have to break up your statement into simple cause-and-effect facts. So, you were compelled to investigate Ambiga because “people had made reports” and the “amount is not small”. I can understand the first reason, where the people’s warrior must respond to the people’s call, but is there any requirement that the reports must have substance before you summon your steed? And that other trifling related matter - do you ever take action against those making false and malicious reports? Next, what is the minimum amount of money required to be an issue for you to act? I mean, does it have to exceed a couple of billion ringgit for a report to be pursued, maybe RM90 million or so? Further, I believe that numerous reports had been made about an international scandal called 1MDB where an amount slightly in excess of RM90 million was allegedly filched. Going by your admirable code of conduct and responsibility, have these allegations also been investigated by you? I must say, Mohamad Fuzi, that you have been on the ranch only a month or so and have already earned the popularity your predecessor had. YHJ: So Ambiga was investigated because two police reports were lodged and a big sum of money was involved. I wonder how many police reports have been lodged about 1MDB and Malaysian Official 1 and the alleged billions involved. Ravinder: It is not standard operating procedure for the police to open investigation papers for every police report lodged. Investigations can even be started without any police reports by the public. Rick Teo: Former PAS vice-president Husam Musa has also alleged that RM90 million flowed into PAS top leaders’ accounts. So why not investigate him also? Why go after only one person? To investigate is very simple. Just request statements from Affin Bank related to the account of PAS president Abdul Hadi Awang and the top leaders. Shunyata: To be fair to Mohamad Fuzi, he at the very least attempts to justify the unjustifiable. His predecessor surely never bothered with such futility, in spite of his plethora of tweets. Anonymous 2460391489930458: All these people are barking up the wrong tree. If they have any issues with whatever that is being said in the UK courts, they are free to direct their grievances or pose any questions they have with the relevant parties there. Ambiga is not a party to the proceedings and is in no way responsible for any statements made in the UK courts. Hence, she is fully and lawfully entitled to maintain her silence on this matter. Any attempts to provoke a response from her should be deemed an act of harassment and should be dealt with according to the law. Unbelievably, it’s the police themselves who are committing these acts. 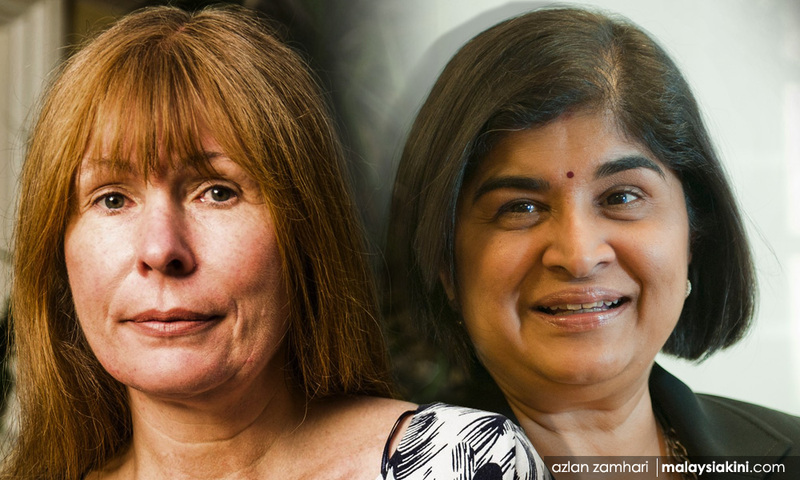 Peninsular Rhino: I’m not alarmed at all by the Sarawak Report defence. What I’m alarmed at is the actuion by the Malaysian police to investigate Ambiga, the potential witness in the case. We have descended into a police state, no doubt about it. Anticonmen: Many do not understand or do not wish to understand the law and individual rights. Blame it on the low quality of education and lack of equality. Anonymous 242641505703475: Why probe Ambiga? Have your day in the London courts. Let us see who is telling the truth and who is lying. Let the British judges weigh both sides' responses. Let the truth be out for the whole world to see. If there is nothing to hide, there is nothing to hide. If there is something to hide, there is something to hide. Right? Why go after a potential witness now? The Day of Reckoning will come sooner or later. Above is God, watching over all of us. Ferdtan: Isn’t this considered interfering in a civil case filed overseas in the UK using state apparatus, when the Malaysian police have stepped in to investigate a reported witness of the case using penal law? The civil case is between two individuals, Abdul Hadi Awang and Sarawak Report editor Clare Rewcastle-Brown. And just because Ambiga was mentioned to be a potential witness, our police, not surprisingly, jumped into the fray to investigate. Harassment takes many forms and this surely is one. However, Ambiga is no ordinary person. She cannot easily be deterred. FairMind: A provides information to B about alleged wrongdoing in confidence. How will this cause alarm to the public? If there is any alarm at all, it is to the alleged wrongdoers; not the public. If the giving of information is causing alarm to the public, then all court cases and whistle-blowing instances will also fall under this. This is the height of absurdity.